Israel has acknowledged it has differences with the US over the expansion of West Bank settlements. Justice Minister Tzipi Livni said Israeli was sticking to a plan to add 3,500 new homes to the settlement of Maale Adumim, linking it to Jerusalem. On Tuesday, US President George W Bush said the international peace plan known as the roadmap called for a halt in the expansion of Jewish settlements. Mr Bush's statement has been welcomed by the Palestinian leadership. Ms Livni said the US and Israel agreed on continued construction within the built-up areas of the settlements. The debate, she told Israeli army radio, was "over whether Israel can expand the perimeter of these communities". 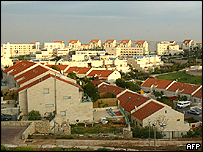 Despite such differences, the minister added, Israel would "strengthen" West Bank settlement. Plans to expand Maale Adumim - which were announced last month - have been fiercely criticised by the Palestinian Authority. It says the expansion will greatly restrict access from East Jerusalem - which the Palestinians want as their capital - and the rest of the West Bank. The Palestinians are also concerned that the project would separate the north of the West Bank from the south. 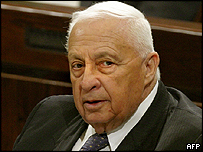 Mr Bush and Israeli Prime Minister Ariel Sharon are expected to discuss the issue when they meet in Texas next week. On Tuesday the US president said: "Our position is very clear, that the roadmap is important, and the roadmap calls for no expansion of the settlements." A spokesman for Palestinian leader Mahmoud Abbas responded by saying he welcomed "President Bush's statement concerning the necessity of implementing the roadmap and stopping all settlement activity". Ms Livni said he did not expect Mr Bush and Mr Sharon to clash over Maale Adumim during their meeting. She said the two leaders agreed on the significance of Mr Sharon's plan to withdraw Israeli settlers from the Gaza Strip, along with the troops that protect them. The Gaza plan has sparked fierce opposition within Israel and among settlers. Wednesday also saw private security guards at a construction site for Israel's controversial West Bank barrier shot and wound three Palestinians. The Israeli defence ministry said the guards had opened fire after the Palestinians crept up on barrier workers at the site, south-west of Nablus, and attacked them. Palestinian officials said the men were holding a sit-in to protest against the barrier's construction. Meanwhile Jewish settlers in the West Bank town of Hebron pelted Israeli forces with stones, as the troops were putting up a wall to protect a Palestinian home from settler attack. A number of settlers were detained after the incident.